Our product range includes a wide range of hi gro ton hydroton. 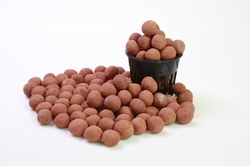 Higro-Ton Hydroton Clay Pebbles is the most versatile growing support medium in Hydroponics. This material is filled with tiny pores much like a 'microsponge'. It thus holds the perfect amount of water and drains any excess water to prevent over watering. Its size and shape ensure the continuous supply of oxygen and its neutral pH helps to maintain optimum pH for the plant. Looking for Hydroton Expanded Clay Pebbles ?